So I’ve been a little obsessed with making ice cream this summer. It started several months ago when I stumbled upon the Jeni’s Splendid Ice Creams at Home cookbook and realized I could make her insanely good Salty Caramel Ice Cream rather than pay $11 a pint for it at our local specialty foods store. I bought the book, went straight to the grocery store for the ingredients, and immediately dragged our ice cream maker out of the basement (you know the one – the one we all got as a wedding present but never used?). Then I remembered the bowl had to chill in the freezer for 24 hours. Ugh. It was worth the wait. All who tasted agreed it was one of the best ice creams they’d ever had and so began my obsession. After making many batches using her recipes (Maple Walnut, Lemon Cream, and Coffee are some of the best) and researching other methods, I’ve begun experimenting on my own. 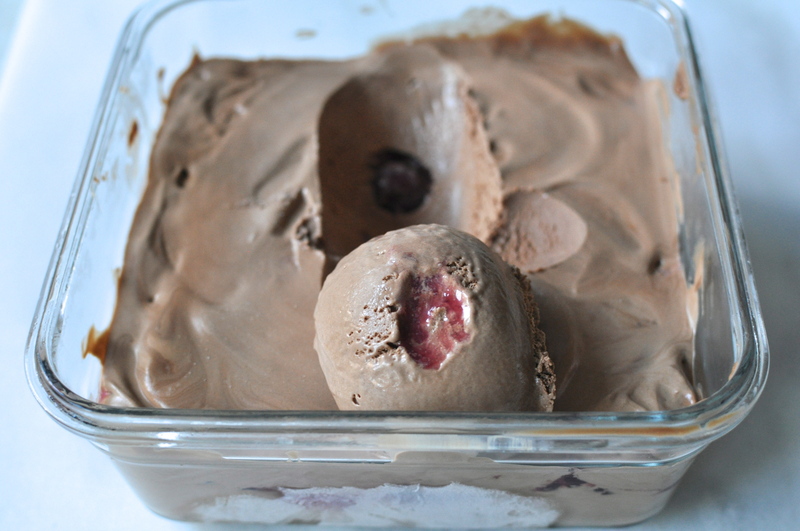 This creamy, rich Chocolate Cherry Ice Cream is definitely one of my favorites. I used the recipe for roasted cherries from the Jeni’s cookbook as roasting intensifies the cherry flavor and creates a thick, delicious, not-cloyingly-sweet syrup that layers into the chocolate ice cream beautifully. I really wanted to poach the cherries in bourbon first so they would taste like an Old Fashioned, but I wanted the kiddos to enjoy the ice cream too, so I decided to make bourbon whipped cream. You MUST try this. Seriously. And don’t forget the chopped, toasted pecans – their rich, salty, buttery goodness will give your sundae the crunch it needs. 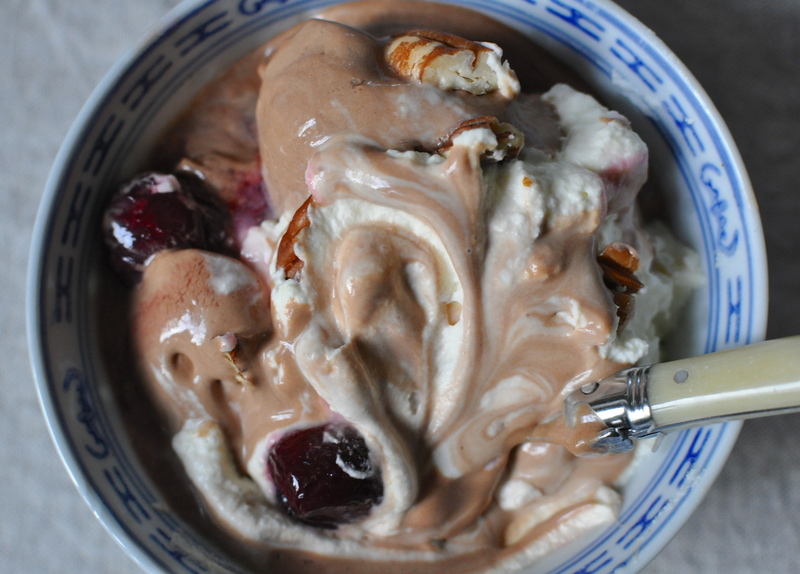 If you don’t have an ice cream maker or the time to make it, you can buy a good quality chocolate ice cream and top it with the roasted cherries and syrup along with your bourbon whipped cream and pecans. It’s all good. Fill a large bowl with ice water and set aside a gallon-sized ziploc bag. Place first three ingredients in a saucepan over medium heat and stir until thoroughly melted. Turn off heat. Whisk the egg yolks with the sugar until creamy. Slowly add 1 1/2 cups of the chocolate/cream mixture to the egg/sugar mixture, whisking as you go. Stir this mixture back into the sauce pan, stir in vanilla and salt, and heat on low until thick and creamy, about 2 minutes. Pour mixture into ziploc bag and seal completely. place bag in bowl of ice water and leave until chilled completely (about half an hour), adding ice if necessary. Pour mixture into frozen bowl of ice cream maker and churn until super thick. Spread one-third of ice cream mixture into your 1 quart container. Add half of cherries and syrup. 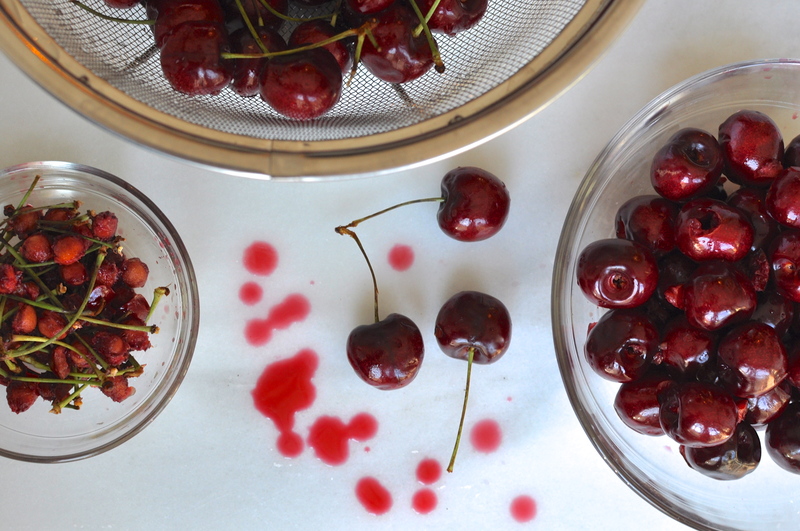 Spread next third of ice cream into the container, and top with the second half of cherries and syrup. Spread last third ice cream on top and freeze, covered, 5 hours or overnight. Assemble your sundaes: Place a generous scoop of ice cream in each dish, top with copious amounts of whipped cream, and sprinkle with plenty of warm toasted pecans. Stir all ingredients together in a 9 x 9 in square baking dish. Roast for 30-45 minutes until juices are thick, stirring every 15 minutes (it took mine just over 30 min). Let cool and refrigerate until cold. Place cold cream in the bowl of an electric mixer and whisk on medium-high until cream begins to thicken. Add sugar, bourbon, and vanilla and whisk until soft and fluffy. Place roughly chopped pecans in a non-stick skillet with the salt over medium-low heat, stirring frequently, until nuts are warm, fragrant and toasted. Assemble your sundaes: Place a generous scoop of ice cream in each dish, top with copious amounts of whipped cream, and sprinkle with warm, toasted nuts. Wow that sounds absolutely amazing! I got that yummy taste of the ice cream but the whipped cream and pecans addition just sounds like perfection! You continue to inspire!